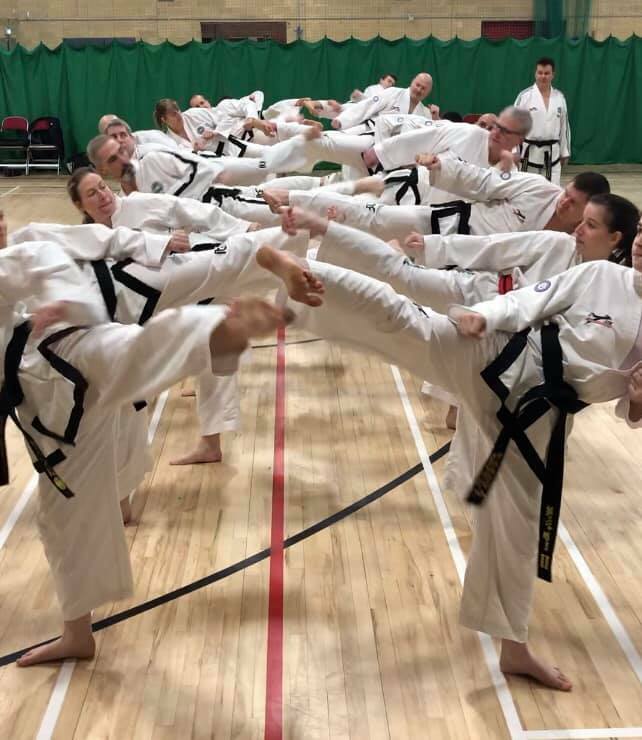 On 20th Jan 2019 T-UK held their National Instructor Course at Stratford upon Avon Leisure Centre. 23 applicants arrived smartly dressed and ready for the morning part of the course which was held in a classroom environment. Many aspects of teaching were covered from benefits to instructor & student, presentation, confidence, marketing, protocols etc. and the general day to day running of a TKD school. The students had 5 workshops to complete where they filled in their thoughts on those various topics. Some great discussions were held throughout the morning which finished with a very positive mood. After the lunchbreak it was down to the Dojang for the practical elements of teaching students. The different age groups were covered and the general ‘do’s & dont’s’ of how to correct whilst teaching, including how to motivate and get the most out of your students. All disciplines were covered and discussed and again a great positive feel ended the day with some of the senior instructors commenting it was possibly the best Instructor Course so far. The T-UK Instructor course is an important part of the criteria to take a degree test for obvious reasons as growth is an essential part for all associations. We look forward to seeing our growth throughout 2019, well done to all !